Fannie Mae’s 2017 Home Purchase Sentiment Index (HPSI) increased in January by 3.7 points to 89.5. 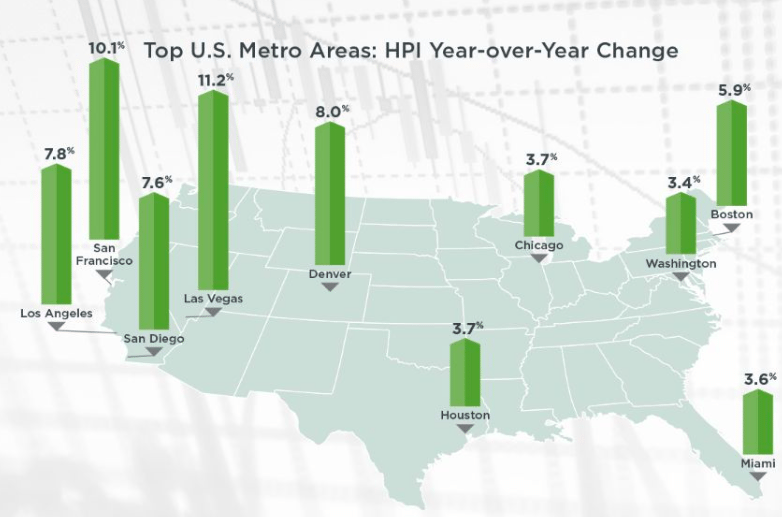 The HPSI is up 6.8 points compared with the same time last year. The net share of Americans who say it is a good time to buy a home rose 3 percentage points to 27%, reversing some of last month’s decline. The net share of those who say it is a good time to sell rose 4 percentage points to 38%. The share who said it is a good time to sell reached a new survey high of 65%. The net share of Americans who say home prices will go up rose 8 percentage points to 52% in January, reaching a new survey high. The percentage who said home prices will go up reached a new survey high of 58%. The net share of those who say mortgage rates will go down over the next 12 months rose 2 percentage points to -50%. The net share of Americans who say they are not concerned about losing their job rose by 5 percentage points to 73%. The net share of Americans who say their household income is significantly higher than it was 12 months ago remained at 16% from last month. 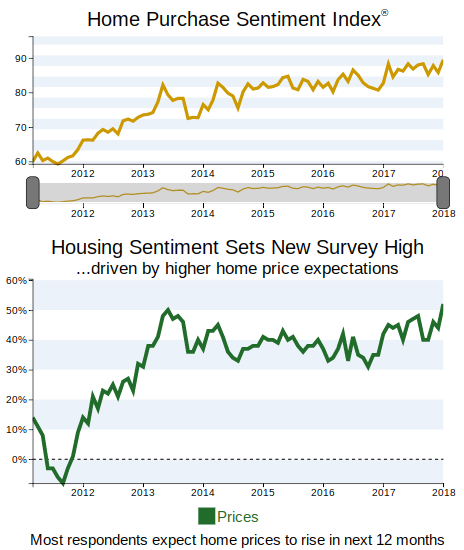 “HPSI rebounded from last month’s dip to a new survey high in January, in large part due to the spike in consumers’ net expectations that home prices will increase over the next year,” said Doug Duncan, senior vice president and chief economist at Fannie Mae. “Results may continue to fluctuate over the coming months as consumers sort out the implications of the newly passed tax legislation on their household finances. Over the past year, continued home price growth has helped spur a sizable increase in the net share of consumers who say it’s a good time to sell a home but also a modest weakening in the net share who say it is a good time to buy. The Market Composite Index, a measure of mortgage loan application volume, increased 0.7 percent on a seasonally adjusted basis from one week earlier. On an unadjusted basis, the Index increased 4 percent compared with the previous week. The seasonally adjusted Purchase Index remained unchanged from one week earlier. The unadjusted Purchase Index increased 7 percent compared with the previous week and was 8 percent higher than the same week one year ago. The refinance share of mortgage activity decreased to 46.4 percent of total applications, its lowest level since July 2017, from 47.8 percent the previous week. 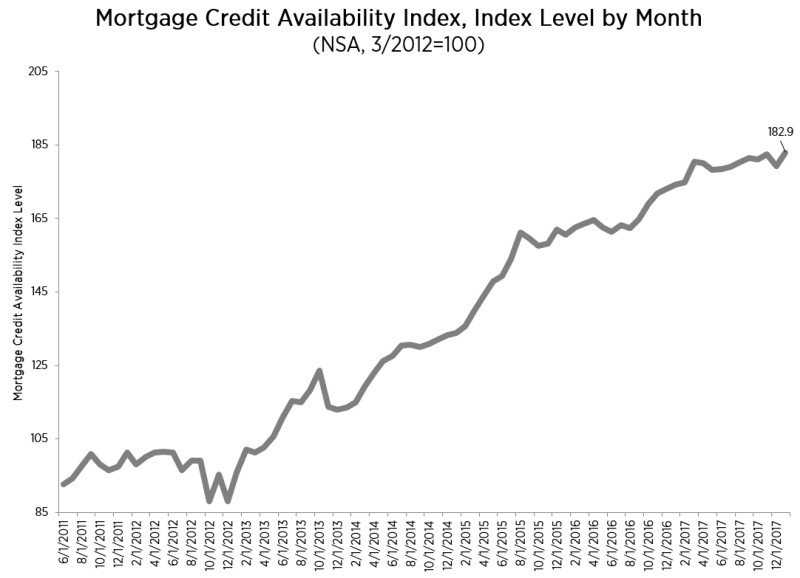 The adjustable-rate mortgage (ARM) share of activity increased to 6.1 percent of total applications. The FHA share of total applications decreased to 10.4 percent from 10.7 percent the week prior. The VA share of total applications remained unchanged at 10.1 percent from the week prior. The average contract interest rate for 30-year fixed-rate mortgages with conforming loan balances ($453,100 or less) increased to its highest level since April 2014, 4.50 percent, from 4.41 percent, with points increasing to 0.57 from 0.56 (including the origination fee) for 80 percent loan-to-value ratio (LTV) loans. The effective rate increased from last week. The average contract interest rate for 30-year fixed-rate mortgages with jumbo loan balances (greater than $453,100) increased to its highest level since April 2014, 4.47 percent, from 4.34 percent, with points increasing to 0.44 from 0.40 (including the origination fee) for 80 percent LTV loans. The effective rate increased from last week. The average contract interest rate for 30-year fixed-rate mortgages backed by the FHA increased to 4.47 percent from 4.40 percent, with points increasing to 0.69 from 0.68 (including the origination fee) for 80 percent LTV loans. The effective rate increased from last week. The average contract interest rate for 15-year fixed-rate mortgages increased to its highest level since April 2011, 3.92 percent, from 3.85 percent, with points increasing to 0.65 from 0.60 (including the origination fee) for 80 percent LTV loans. The effective rate increased from last week. The average contract interest rate for 5/1 ARMs decreased to 3.77 percent from 3.79 percent, with points increasing to 0.42 from 0.41 (including the origination fee) for 80 percent LTV loans. The effective rate decreased from last week. 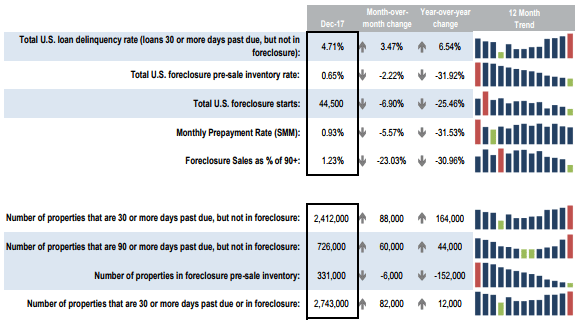 Home prices nationwide, including distressed sales, increased year over year by 6.6 percent in December 2017 compared with December 2016 and increased month over month by 0.5 percent in December 2017 compared with November 2017 (revisions with public records data are standard, and to ensure accuracy, CoreLogic incorporates the newly released public data to provide updated results). 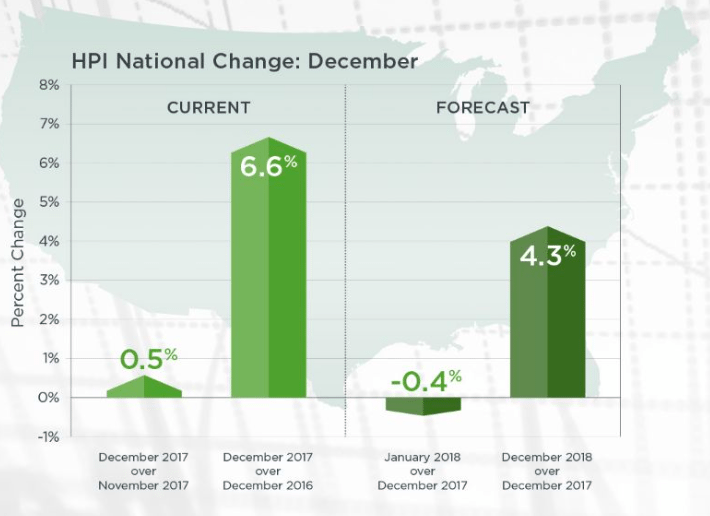 The CoreLogic HPI Forecast indicates that home prices will increase by 4.3 percent on a year-over-year basis from December 2017 to December 2018, and on a month-over-month basis home prices are expected to decrease by 0.4 percent from December 2017 to January 2018. “The number of homes for sale has remained very low,” said CoreLogic chief economist Dr. Frank Nothaft. “Job growth lowered the unemployment rate to 4.1 percent by year’s end, the lowest level in 17 years,” he said in the report. The MCAI increased 2.1 percent to 182.9 in January. A decline in the MCAI indicates that lending standards are tightening, while increases in the index are indicative of loosening credit. The index was benchmarked to 100 in March 2012. The Conventional MCAI rose by more (up 3.6 percent) than the Government MCAI (up 0.9 percent). The component indices of the Conventional MCAI both increased from the month prior, with the Jumbo MCAI gaining more (up 6.1 percent) than the Conforming MCAI (up 1.1 percent). “Credit availability increased across the board in January, more than reversing December declines in almost all component indices,” said Lynn Fisher, MBA’s Vice President of Research and Economics. 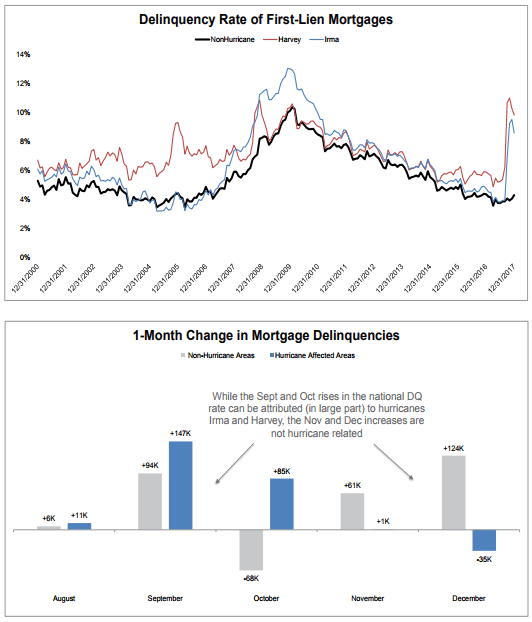 “Hurricanes Harvey and Irma significantly impacted 2017 mortgage performance metrics,” said Black Knight Data & Analytics Executive Vice President Ben Graboske. “Overall, there were approximately 164,000 more past-due loans at the end of 2017 than the year before, pushing the national delinquency rate to a 23-month high. “When Black Knight isolated non-hurricane-impacted areas – which represent 90 percent of the entire active U.S. mortgage universe – we see the national delinquency rate actually fell to 11 percent below long-term norms. Likewise, the 90-day delinquency rate was also up six percent from last year, with roughly a third more seriously delinquent loans than we’d expect in a healthy market. “Excluding the hurricane impact, though, we see that there were 84,000 fewer loans 90 or more days past due than last year; a 14 percent reduction. The national non-current rate – which tracks all loans 30 or more days past due or in active foreclosure – edged down slightly from 2016, even including the effects of the storms.